15 MINUTE WAIT, most cases! If your vehicle fails the smog test, we are equiped with the latest, state of the art diagnostic scaner, and we'll be able to tell you exactly what the problem is with your vehicle. In most cases repair is done right away, then we retest the car at no cost and you be on your way. ASK ABOUT OUR DIAGNOSTIC DISCOUNT! 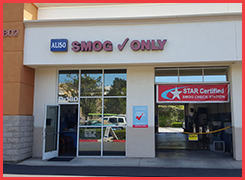 The trained technicians at Aliso Smog Check in Aliso Viejo, California, can get your vehicle in right away. Going to a mechanic often means you'll have a long wait before your vehicle is even seen. We'll get you tested and ready to drive away in less than 20 minutes. Our team is available to work on cars, trucks, and recreational vehicles. We're equipped with four lanes, allowing us to test multiple vehicles at once. Our emissions test facility also features high ceilings, so we can check vehicles of any size. You can stop by anytime we're open for an accurate smog check. To get here starting from the Aliso Viejo Town Centre, take a right on Aliso Creek Road going south to Liberty Street. Turn left into the Plaza, and you'll find Aliso Smog Check in the far left corner. We look forward to serving you. Monday - Friday: 8:0 a.m. - 6:00 p.m.